Our team of Soapbox Science organisers – Dianne Ford, Paula Salgado, Nancy Rios, Kevin Waldron, Lis Lowe and Joanna Keith – are definitely doing it again! It was fun and rewarding! On the 27 of June 2015, Soapbox Science, a team from Newcastle University and a fantastic group of speakers and volunteers helped transform the Monument area in Newcastle City Centre into a hub for science and discovery. 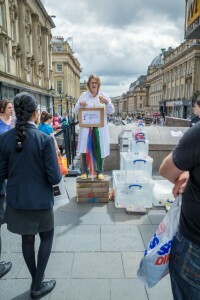 As female scientists from across the region – and beyond it – took to the streets, got on a soapbox and showcased their science to the public, the aim was simple: bring science and the women doing it to the attention of the general public. 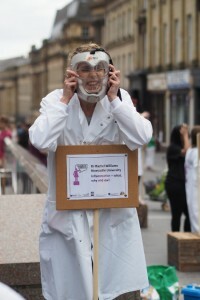 Founded five years ago by Dr Seirian Sumner (University of Bristol) and Dr Nathalie Pettorelli (Zoological Society of London, ZSL), Soapbox Science has grown exponentially and this year there were seven events taking place in Bristol, London, Exeter, Swansea, Newcastle, Glasgow and Belfast, with over 90 female scientists participating. 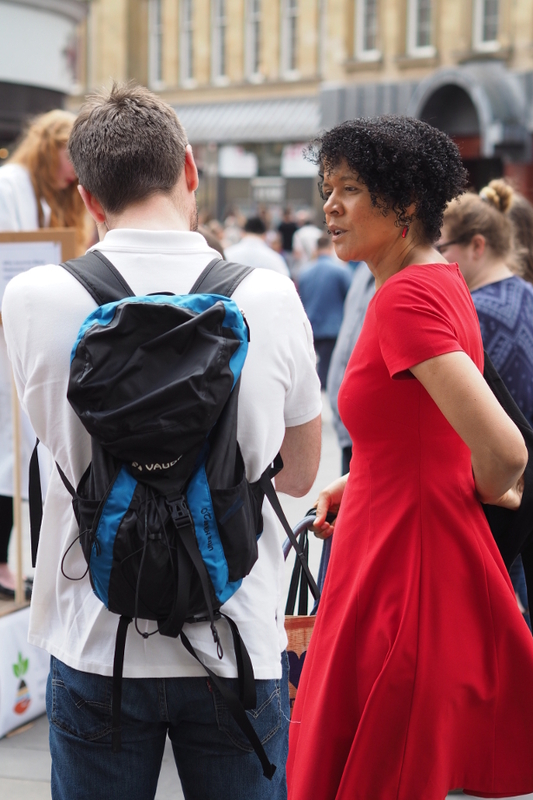 For the Newcastle event, it all started when Prof Hilary Lappin-Scott, Vice Chancellor at Swansea University, visited in the summer of 2014 to speak at ICaMB‘s Equality in Academia day. Having just run Soapbox Science for the first time in Swansea, Hilary set us the challenge of doing the same this year in Newcastle. A few early indications of acquiescence and some tentative enquiries resulted in little immediate progress, but then Nancy discovered that it was her old friend, Seirian Summer that, together with Natalie Pettorrelli, was responsible for coordinating the whole operation nationally (and are branching out now globally). With Nancy, on board we began to motor ahead. 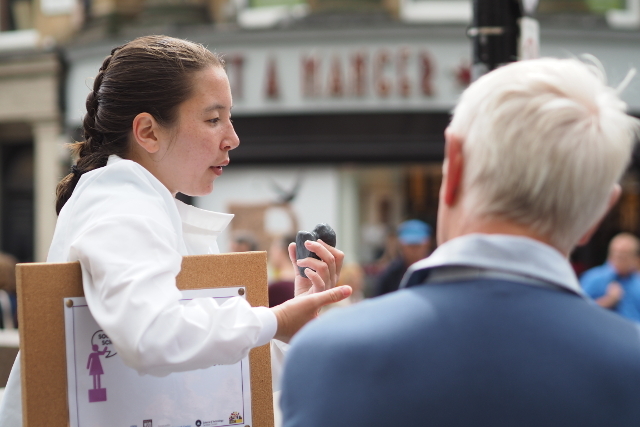 Potential speakers and volunteers responded enthusiastically to our call and it was tough to decide who should make up the final bill of inspirational women scientists speaking on diverse and engaging topics. 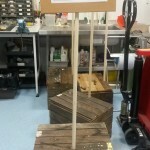 Soapboxes were ‘commissioned’ (huge thanks to Newcastle Wood Recycling for their generosity and time and ICaMB’s workshop team for their inventive solutions!) 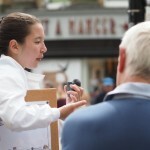 and the go-ahead was given to set up at the Monument on our chosen Saturday afternoon. We were assured that the Morris dancers would be finished (they were, and only one of them then heckled us). That bit of meteorite used by Christina McQuirk was heavy! Even the potentially tedious jobs such as completing a risk assessment provided some amusement, courtesy of an email thread with the subject line ‘meteorite risk assessment’. 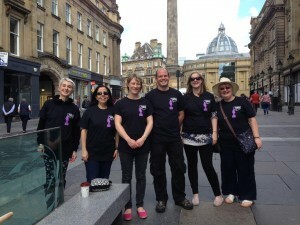 We drew up a press release and got some media interest, including interviews on BBC Radio Newcastle. 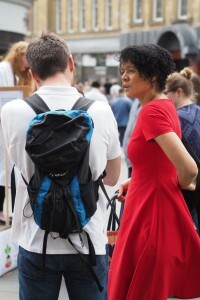 Nancy even found a small team of filmmakers from the Tyneside Cinema to record the highlights and interview the speakers, volunteers and spectators, including local MP Chi Onwurah who came by to offer support. 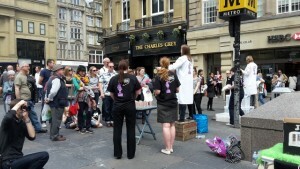 In our matching Soapbox Science T-shirts, we were (as was overheard) mistaken for a hen party! Not quite, sir! 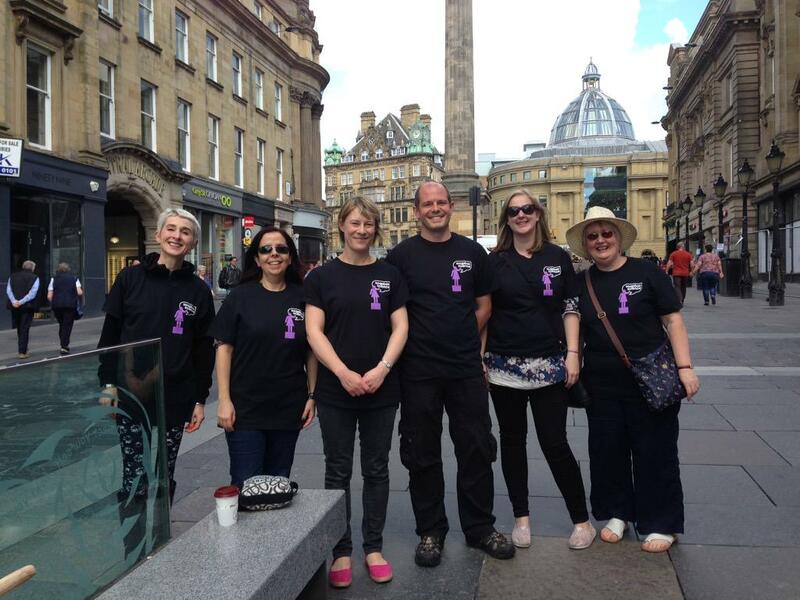 Matching t-shirts – what could it be? We learnt a lot (there were mistakes!) 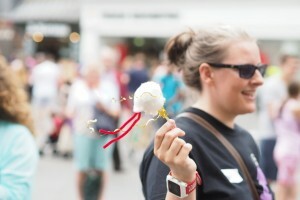 and look forward to putting on an even better event next year. 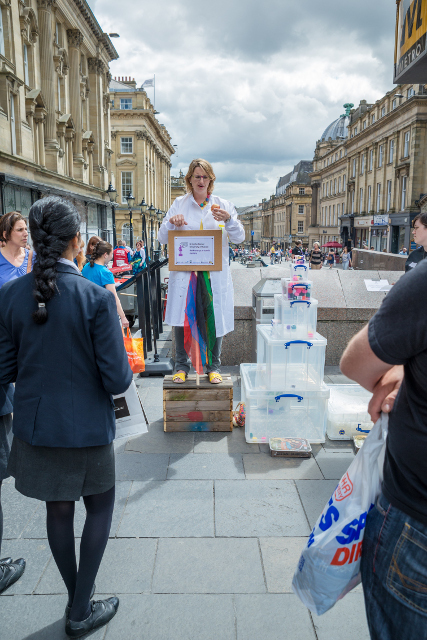 See you next summer, for Soapbox Science Newcastle 2016! 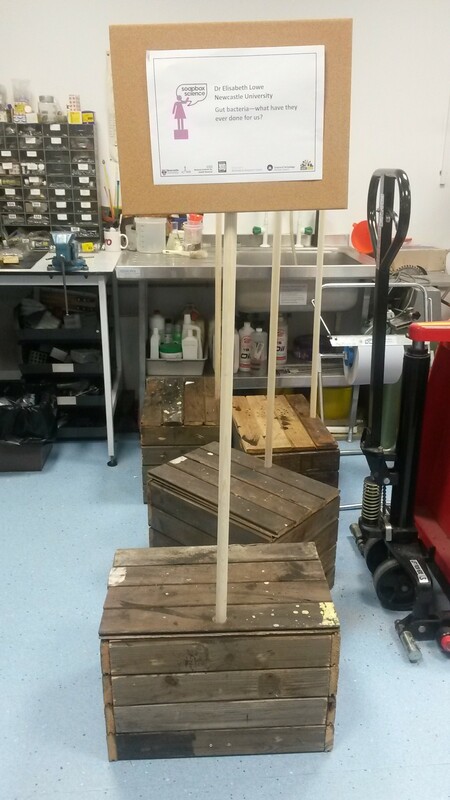 This entry was posted in Events, Science Communication and tagged Female Scientists, public engagement, Soapbox Science by Paula. Bookmark the permalink. Sorry I could not make what was obviously a fund but valuable event (on my way back from a conference).